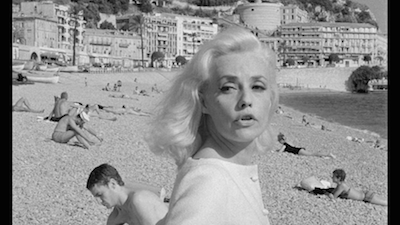 Just how much money would you throw away for Jeanne Moreau? Personally, they couldn’t print the stuff up fast enough to keep pace with my wanton spending. 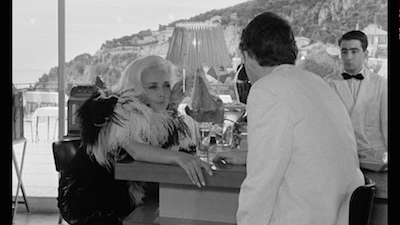 Because, come on, she’s Jeanne Moreau. 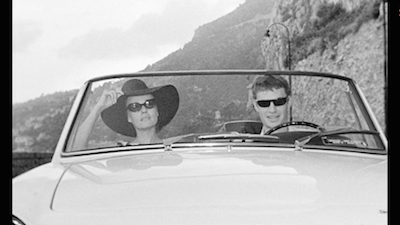 There are several points throughout Jacques Demy’s 1963 post-noir gambling picture Bay of Angels when Jean (Claude Mann, Army of Shadows [review]) has to ask himself how much he’s really prepared to lose for Moreau’s Jackie. She’s the former wife of a rich industrialist, cast aside on account of her addiction, leaving husband and child behind for the roulette tables on the French Riviera. Jean is rather new to gambling, but he’s already turned his back on his father to take this trip to Nice. A co-worker took him to the casino and he won big, and he thinks he kind of has it figured out, that he can guess what numbers will come up next by keeping track of the odds. Jean first spies Jackie on that initial daytime gambling outing, when he and his buddy (Paul Guers) ditch work and the other fellow shows him the ropes. Jackie is being thrown out of the casino for cheating. When they run into each other again, she denies this at first, but the more she comes to cling to Jean, whom she sees as a good luck charm, Jackie gets more and more honest. Bay of Angels tracks the highs and lows of their few days together. When things are going well, they chase the win, and Jackie indulges in every luxury she can imagine the moment cash comes her way. More often than not, though, they are riding the loss, drowning their sorrows, scheming for new ways to find money to keep playing. Jean tries to be practical, he plays little tricks to hide funds away, but Jackie figures him out. It’s like how alcoholics stash booze around the house. Jackie knows where to look. 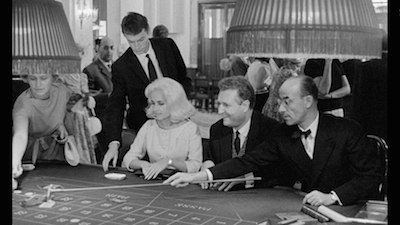 Demy wrote the script in addition to directing, and he gets the manic mood swings of compulsive gambling, Michel Legrand’s hurried theme coming back on time and again to remind us that the fever has taken over. There’s much lying and equivocating going on. Both Jackie and Jean acknowledge having problems several times before immediately flipping and denying there is such a thing. Jackie manipulates Jean, and he sometimes gets mean and even violent when he catches on, but that’s also part of their ride. She plays him in a chancy game of seduction, and sometimes she guesses wrong when it comes to how much he can actually take. Moreau is brilliant here, decked out in tight dresses and bleached hair, which she regularly plays with, a weird quirk of habitual vanity that makes her look a little Mae West and a little Marilyn Monroe. She is a natural mess, not too over-the-top or caricatured, often drunk and regularly in the middle of a con. There’s a bit of survivor to her, which inspires how she uses others. The performance makes me think of Faye Dunaway in Barfly : ladies who will do what they have to in order to get what they need. Demy tries to warn his protagonist away--the film literally opens with the camera fleeing away from Jackie--but Jean’s done in by her all the same. Jackie is a classic femme fatale. 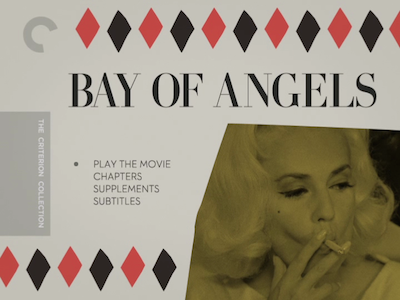 And Bay of Angels is essentially a crime film without any actual crime. Back when Ed Brubaker and Sean Phillips were doing their masterful pulp comic book Criminal, , they had essays in the back of the issues from guest writers talking about some of their favorite film noir and crime movies. I always hoped I’d get asked to contribute, I wanted to write about Bay of Angels. There is no heist nor even petty theft, and only a little bit of cheating, but it’s a crime movie all the same. In part, it’s the seedier side of the criminal lifestyle. The fleabag hotels, the big scores turning into big losses, the plans that go nowhere--it’s the harsh truth that comes after the bad deeds are done. But it’s also the damage that this pair does to each other. That is the real criminal behavior. Jean may be manipulated by Jackie, but he eggs her on to do it. He puts her on a pedestal and encourages her every whim. The more foolish she acts, the more smitten he is. He is a chump. And yet they also have some actual affection for one another. The last shot of Bay of Angels is a reverse on the first, this time Jackie running toward the lens to catch her man before he gets away. The movie was photographed by Jean Rabier, who also worked with Demy’s wife Agnes Varda [here, and here] and would go on to shoot The Umbrellas of Cherbourg. 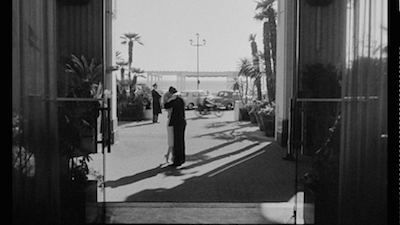 His work here more recalls the realism that he brought to The 400 Blows [review], however; Rabier and Demy work with real locations, shooting in actual hotel rooms and in back alleys and boardwalks, to give Bay of Angels its grimy atmosphere. There is nothing glamorous about how these gamblers live, save for the rare occasions they are flush and upgrade to new clothes, a new car, and a suite in a fancier hotel. They exist in pockets of the world nestled within the same spaces where the rest of us live. Rabier’s framing emphasizes this by isolating them. The lovers often appear to be moving about separate from the rest, as if everyone else in the room is locked into a different speed and oblivious to their presence. Then again, that love affair is its own addiction. They can’t give up on each other any more than they can give up on gambling. That’s the true tragedy of it all. They need and deserve each other just as much as they are one another’s particular poison. Nourishing and fatal all at the same time. Amazing article Thanks for posting.